‘How To Get Away With Murder’ 5×04 recap: Nate’s digging could spell disaster. But for who? WARNING: The following article contains spoilers for the fourth episode of season five of How To Get Away With Murder titled “Its Her Kid”. Do not read if you have not seen the episode or read ahead at your own risk. After four episodes of digging into Bonnie’s past, things are beginning to look grim for Nate Lahey at the conclusion of Thursday’s How To Get Away With Murder. The main storyline involved Annalise (Viola Davis) working to get Nate Sr.’s case to go to trial. But in order to do that, they need to convince the judge he did not know the difference between right and wrong at the time of his fellow prison inmate’s murder. Annalise tasks her students with going through 30 years of evidence to prove Nate Sr. was clinically insane at the time of the events in question. At Nate Sr.’s psychiatric evaluation, he recalls the details of the murder and you can see that he is physically bothered by it all. Then the question came of did he know right from wrong and he replied with the answer of wanting cake. Combine that with the students’ strongly written statement and Nate Sr. is going to trial. The subplot continues to revolve around Bonnie (Liza Weil) and her long-lost child. Nate (Billy Brown) continues to push Annalise to tell Bonnie the truth. She protests, for now, which leads Nate to track down Bonnie’s sister. Another curveball reveals that she is not an identical twin. Well, there goes that theory. This woman has a son, who is not Gabriel Maddox. So HA! It looks like Gabe isn’t Bonnie’s son after all. So Nate steals a dirty needle from the kid’s car to have tested for DNA. Annalise decides to tell Bonnie the truth, which leads to her breaking down. Bonnie questions why Nate lied to her about this, but Annalise says he wanted her to have a chance like he is getting with his father. We flash forward to Oliver and Connor’s wedding, which is now a month and a half away. Connor is questioning where Oliver is, so Michaela says she’ll call his phone. Instead, she calls Nate’s number. But Bonnie has his phone and doesn’t answer. Uh… Why does Bonnie have Nate’s phone? Where is Nate? Heck, why did Michaela call Nate and not Oliver like she said she would? It seems like Nate’s digging has gotten him into trouble because, based on next week’s preview, Bonnie is not happy with Nate. So much drama and mystery, but that’s what we love about this show. One thing I will say, this show doesn’t do the obvious. Personally, I don’t think Nate is dead. 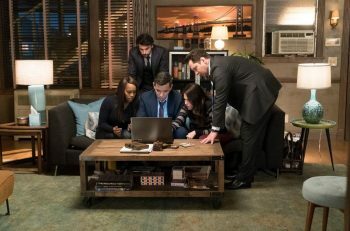 Oliver confronts Frank on why he is looking into Gabriel, but Frank quickly covers his tracks by saying he looks into all of Annalise’s students. 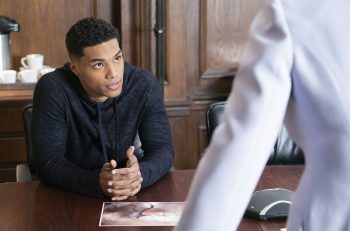 Oliver does his own digging (man, I’ve used digging a lot in this recap) and uncovers Gabe was arrested for felony assault. Who is Gabriel really? My theory: he is actually Wes’ brother. Michaela’s not hated as much by Tegan. That’s a good thing… I guess? Tegan tested Michaela without her knowledge as she dug up dirt on Ruth Stevenson, a new CEO that C&G is handling a case for. Tegan tells Ruth her hate level for Michaela went from a 10 to 8. So… congrats Michaela? Ronald Miller is officially named the interim district attorney and he wants to take his and Bonnie’s relationship public and wants her to sign a human resources form. She was going back and forth all episode and was set to sign it until Annalise called her with life-changing news. What did you think of How To Get Away With Murder? And who do you think died at the wedding? Let us know in the comments below. ‘How To Get Away With Murder’ 5×14 recap: Wait.. Who did what?